With utter disregard for his own safety, Sgt Takeba ran over the open terrain to his wounded comrade. Although bullets were flying all around him, Sgt Takeba picked up the man and carried him 75 yards over exposed rocky terrain to a covered position. Masaharu "Masa" Takeba was born on April 24, 1918 in Honolulu, Oahu. He attended McKinley High School, Oahu.Before entering the service, he was employed as a table captain at the Hawaiian Pineapple Company in Honolulu. 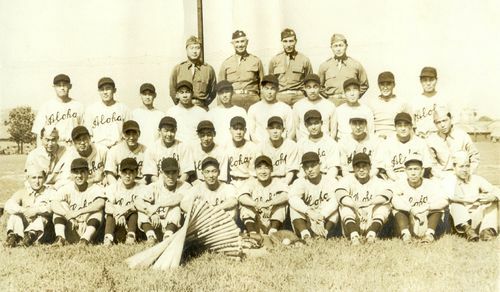 Takeba was inducted in the Army on June 30, 1941 and initially served with the 298th Infantry Regiment at Schofield Barracks. Like many people in Hawaii, he was Nisei - second-generation Japanese, and on December 7, 1941, when the Japanese attacked the US fleet at Pearl Harbor, everything changed. Americans of Japanese ancestry in Hawaii were treated with suspicion and those in military service found their duties suddenly reduced to menial tasks. For gallantry in action on 7 January 1944, in the vicinity of Cervaro, Italy. Sgt. Takeba, acting as platoon sergeant led his men in occupying part of the north end of Hill 1109, without knowing that the enemy was on the top of hill approximately 200 yards away. With excellent observation the enemy immediately delivered heavy mortar, machine gun and rifle fire on Sgt Takeba and his platoon. One of his men was hit by an enemy sniper and seriously wounded. Notifying his second-in command that he was going to advance forward and at the same time take the wounded man to cover, he instructed the platoon to cover his advance. With utter disregard for his own safety, Sgt Takeba ran over the open terrain to his wounded comrade. Although bullets were flying all around him, Sgt Takeba picked up the man and carried him 75 yards over exposed rocky terrain to a covered position. By his heroic deed in the face of heavy enemy fire, Sgt Takeba saved the life of his comrade who undoubtedly would have been killed if left on the open terrain exposed to further enemy fire. The coolness, courage and excellent leadership of Sgt Takeba was highly commendable and in keeping with the finest traditions of the military service. Masa Takeba is buried at the National Memorial Cemetery of the Pacific in Hawaii.